This class has been expertly designed to use the beat of the music to elevate your cardio workout, improve endurance, strength and coordination. Expect speedy sprints, aspiring climbs, strength building jumps, an arm weight track to tone your upper body and cool choreography so you leave class on an endorphin high. This class is for everyone, whether you are just getting back into fitness, kicking off your fitness goals or a fitness pro. Most of all this class is tonnes of fun, so bring a friend and get dancing on the bike. Metric Ride has been designed to improve the 3 key areas of cycling which are Endurance, Climbing and Power. It is not here to replace outdoor cycling, it’s built to improve your athletic performance in a competitive yet supportive setting. With that in mind you can expect endurance intervals designed to make you stronger for longer, hill climbs to improve your lactate threshold and power intervals that will push you to smash any sprint finishes! Our virtual rides means you never have to miss a class. Be guided by our virtual instructor and benefit from the motivating environment in our studio to achieve a great workout and fantastic results. A get in, sweat, get out class designed for maximum effort in a short period of time. Our heat class works on a longer work phase with less rest. The intensity is lower but the effort is the same. A great addition to a weekly HIIT training programme. Let our coaches guide and motivate you through this small group training session where you can burn up to 800 calories* in a 45 minute session. Use the District heart rate monitoring system designed so you can maintain the right intensity zone to stimulate metabolism and burn energy. This training method stimulates calorie burn for up to 24 hours after your workout**. just enough time to do your next class. Fast track your results with District HIIT45. 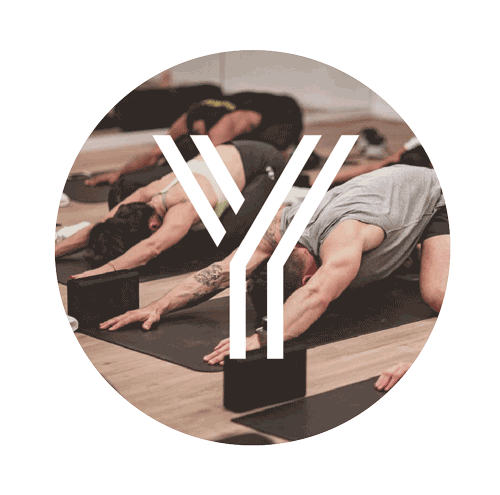 A Flow class has a Vinyasa base with a mix of stretch and strength, balancing the qualities of relaxation, focus and movement. Expert instructors guide you through at a level suited to each individual, so you can choose to be dynamic or soft with your flow to gain your optimum from this Yoga workout. A fantastic stretch for the body and re set for the mind. A slower paced class where poses are held for longer periods of time, encouraging you to relax into each posture, lengthening and the balancing the body and calming the mind. Restorative yoga is a form of yoga that seeks to achieve physical, mental and emotional relaxation with the aid of props. While some restorative yoga poses are beneficial to the entire body, others target specific parts of the body, such as the heart or the lungs. It is especially useful to help eliminate fatigue and daily stress. Our signature, 45 minute class is the perfect blend if you’re looking to tone, strengthen and lengthen. Intense but fun, this class will transform your body and challenge your mind. Work evenly through muscle groups gaining strength, control, awareness of the body and creating great posture.